A twinkling 9ct white gold ring is set with a quarter of a carat of diamonds, complemented with gorgeous pink sapphires. Perfect as a gift or as an engagement ring, this beautiful piece can represent your true love and commitment, as well as the promise of a wonderful future together. 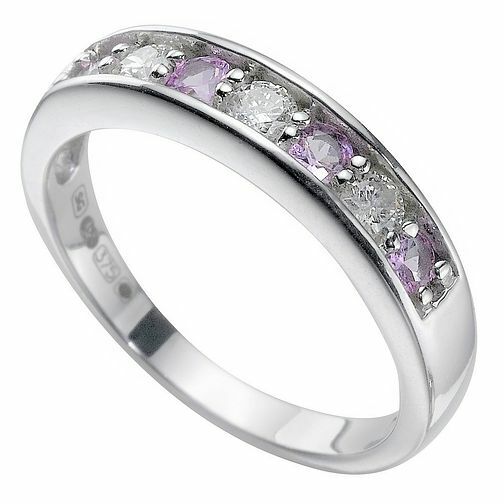 9ct white gold pink sapphire and diamond ring is rated 5.0 out of 5 by 2. Rated 5 out of 5 by Anonymous from Perfect in every way. The most romantic ring ever. My partner brought me the ring ,he placed it on my finger and kissed it twice. I said "I love the ring,' he replied 'I Love the lady who is wearing it.' Perfect pretty pink sapphires and beautifully sparkling diamonds. Definitely would recommend to anyone.